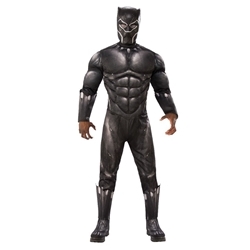 The Black Panther Adult Costume includes Padded Jumpsuit with Boot Tops and Mask. This costume is available in Adult Sizes Standard or X-Large. Take on the role of the fierce Marvel Super Hero, Black Panther! Equipped with the raw power of Vibranium, the spiritual connection to Wakanda, and his own strength and speed acquired through training, T’Challa is a hero not to be taken lightly. The Black Panther Adult Costume let’s you channel T’Challa’s iconic look for Halloween or for a Cosplay Event. Pair with Black Gloves and join your fellow Avengers in protecting the Earth!